Please come out and join us for our November Spirit Service of 2018! 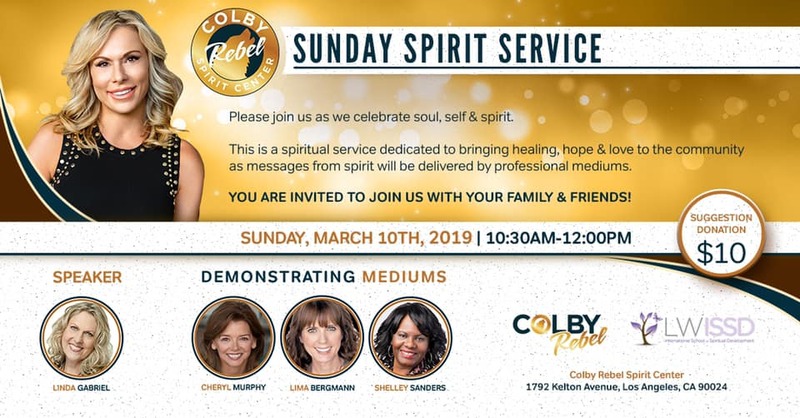 This is a spirit service dedicated to bringing healing, hope & love to the community as messages from spirit will be delivered by professional mediums and an industry expert Karen Gabler deliverers a talk How to recognize SIGNS from your LOVED ONES in SPIRIT. ALL are welcome! 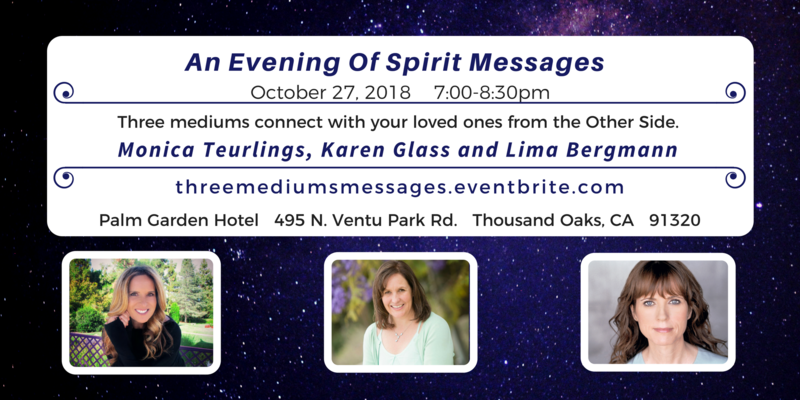 Please join Mark David (for Sound Healing experience) and Mediums Susan Schueler and Lima Bergmann as they deliver messages from Spirit. 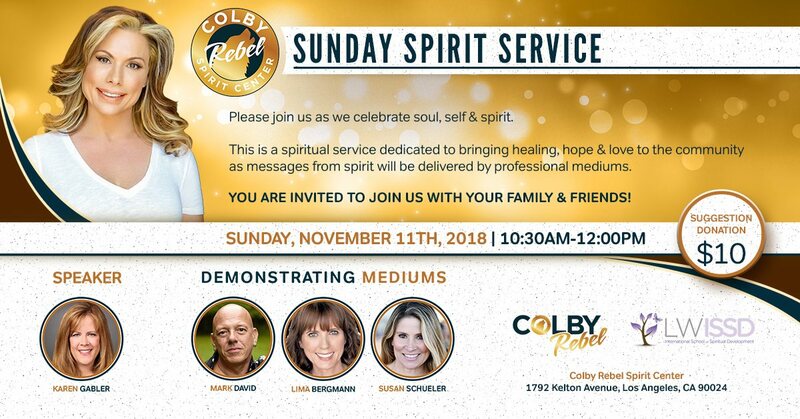 Come join us as we celebrate spirit, soul and self on Sunday, November 11th, 2018 10:30am-12:00pm. $10 Suggested Donation. Please come out and join us for our June Spirit Service of 2018! 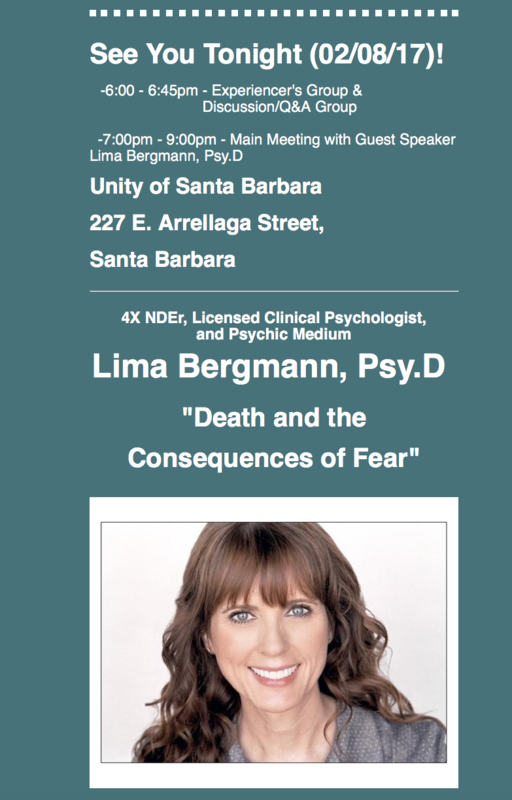 This is a spirit service dedicated to bringing healing, hope & love to the community as messages from spirit will be delivered by professional mediums and an industry expert Lima Bergmann deliverers a talk about Near Death Experiences. ALL are welcome! 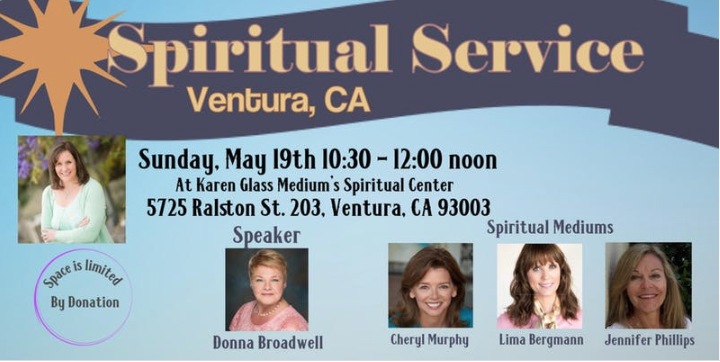 Please join Kelly Brickel Jules Davis and YuSon Shin and Terrie Huberman as they deliver messages from Spirit. 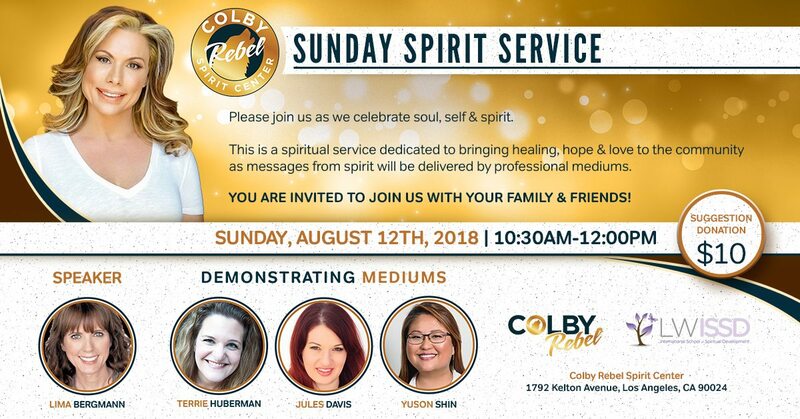 Come join us as we celebrate spirit, soul and self on Aug 12, 2018 10:30am-12:00pm. $10 Suggested Donation. PLEASE share and RSVP so we can have the proper number of chairs available. Life today is busy and so much of our time is spent online that we are staying in touch with everyone else at the cost of connecting to our Soul Self. As a result, happiness is often lost in the comparison to what others are doing and achieving instead of knowing what we really want from life and how to allow it to unfold. Take some time out to spend a day with three women, each with a special message for you, to rekindle the peace, happiness, and love for yourself on your inner journey through life. Turn off the external noise for the day and spend some time getting back in tune with your wise and loving self. 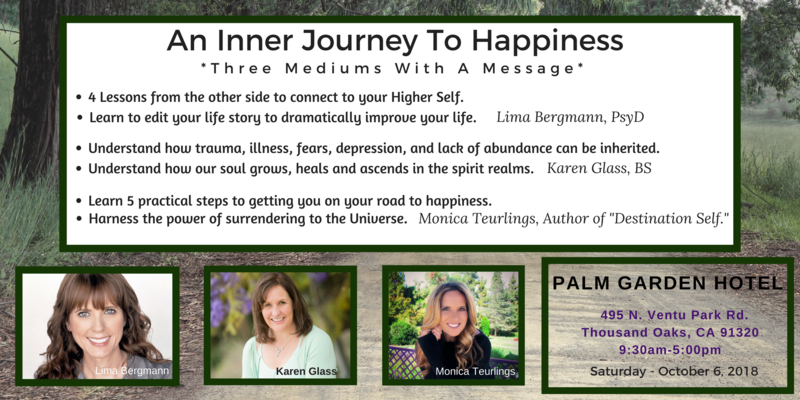 We are three speakers here who are looking forward to taking you on a journey to your inner self to find the happiness that abounds. This is a full day event that you will not want to miss! You will take a journey within to look at your soul and discover who you truly are and how to create a more joyful life. Monica will be selling her book at the event for only $9.99. We will have raffle prizes: Three chances to win one free reading from each medium, Lima, Karen and Monica. AND...We will be giving away tickets to our Platform Mediumship Event on October 27th. Please join us for a wonderful day filled with love and opportunity for growth. Dress comfortably and bring pen and paper. Get your ticket now at the Early Bird rate of $65.00 through 8/31/18. Beginning 9/1/18 the price will increase to $75.00. We will be sharing messages for the audience from your loved one's in Spirit. It is our mission to share with people that life is eternal and give people an opportunity to connect for closure, healing and love. Messages are provided through the evening, however, we cannot guarantee that everyone will receive one.